Love butterflies? 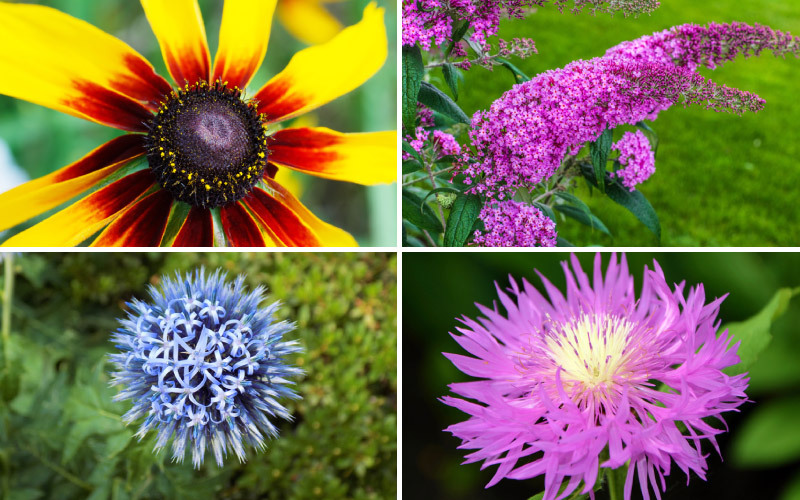 You don’t have to happen upon these flying insects by chance; check out our guide of flowering plants that will bring them to your garden. The color of this beautiful flower will remind just about anyone of the precious purple stone, and butterflies find this plant just as attractive as humans. This is a delicate flower that also seems to love moist soil. If you want this flower for your garden, it grows best in zones three through eight. As the name suggests, this is definitely a big hit with your favorite butterfly species. The flowers on the butterfly plant are orange, and the plant itself is a close relative of milkweed. This is definitely a pollinator-friendly plant that also grows in abundance in zones three through nine. This is also a great plant to dissuade pests like deer. If you love blooms that have varied colors, then lantana is definitely a butterfly-friendly plant that you should consider for your garden. In many cases, the blooms have a light pink coloration on the outside of the flower and the centermost buds are orange and sometimes yellow. Lantana grows in zones 10 and 11. If you grow this, expect the plant to die back if the plant is exposed to temperatures below 28 degrees Fahrenheit, but it will grow back in warm weather. When you look at the bluestar bush, the first thing you’ll notice is the thin needlelike foliage that springs out in every direction underneath the blooms. The blooms themselves are prized by a plethora of butterfly species and are known for their star shape. Bluestar plants grow in zones three through nine, and if you’re planning on growing them, expect them to bloom in the spring and turn a beautiful golden color in the autumn. Black-eyed susan plants almost look like sunflowers that have a black center that pollinators love. The golden yellow petals extend out in a spoke pattern and look beautiful. This plant blooms yearly in zones three through seven, and you can expect a growth that will top out around two feet in height. It’s best to plant these when the soil temperature is around 70 degrees Fahrenheit. Not only is stonecrop a favored plant for butterflies, but this sedum is also known for its deer-resistance. The flowers from the stonecrop plant tend to grow a bright and lively pink, and you can expect an active growing period of at least six months. Usually, this type of sedum is found in zones four through nine. As the name implies, this is a pollinator favorite. Not only will this plant attract butterflies, but hummingbirds and bees will love you for planting bee balm. Use well-drained soil that has a pH between 6.0 and 6.7, and you should have no issues with growth. Additionally, this perennial plant is known to grow in zones four through nine. This perennial is a hardy plant that can be found growing naturally in the southeast of the country. In most cases, zones five through nine are favorable for this plant; just make sure that you grow it in moist, well-drained soil that has a somewhat acidic content. Related to the sunflower, globe thistle is known for its violet-colored nearly perfectly round flower heads. This plant is fairly hardy, and you can expect to be able to grow it in zones three through nine. This is a plant that blooms between the midsummer to the early fall, and it can grow as high as four feet. The foliage of the shasta daisy is known for being evergreen, which means that this is a great year-round plant that will provide beautiful and dainty blooms in the summer months. Shasta daisies can be found in zones five to nine and can grow up to three feet in height – just remember to use fertile soil. At home in zones two through 11, the marigold is known for its pretty blooms. That being said, these plants really will only grow during the warmer months. In addition, it requires warm soil, so sow seeds in the spring. Once planted, the plant will sprout and bloom within an eight-week period. With flowers that range from shades of pink to purple, aster is a beautiful flowering plant that will bring butterflies to your garden. Moist climates are preferred by this plant, but once it starts growing, you can expect the plant to grow as high as eight feet. These plants need plenty of water and will grow in zones three through eight. At home in zones three through eight, hollyhocks consist of several flowering plants that butterflies seem to love. Just be patient; hollyhocks are biennials, so you’ll have to wait a year before you see blooms. Who doesn’t love the smell of lavender? To grow this purple-blooming plant, you should use well-drained soil. Sometimes, this plant has grayish foliage, so if yours is lacking in color, don’t worry too much. You can grow most variations of this plant in zones five through nine – just remember to plant it right as the soil is starting to warm. Blazing star flowers have always reminded me of purple fireworks that are jetting into the sky, and this plant definitely loves to get vertical; you can expect these to grow as high as eight feet. These plants are at home in zones three through nine, and if you’re thinking of growing them, give them plenty of light and good drainage.